Watch Your Child's Imagination Run Wild as They Build With MAGFORMERS! My husband is an engineer and all three of our children seem to have that same type of interests where they like to design and build things! Building with blocks and other materials is definitely a favorite family activity! One type of block we didn't have (til now!) is magnetic building blocks. My son was just talking about how he would love to build with blocks that are magnetic and then I was introduced to MAGFORMERS! These new magnetic building kits are definitely going to be a NEW family favorite building material! 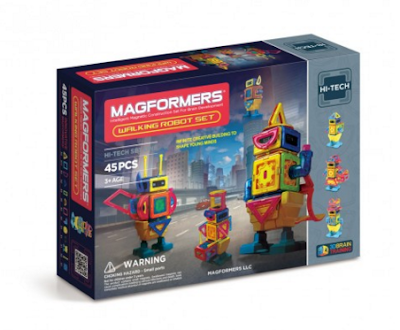 Developed for the architects of the future, MAGFORMERS is the industry leader in magnetic building toys for children. MAGFORMERS prides itself in the quality of its products and the unique constructional play experience they deliver. Each shape contains rotating Rare Earth Neodymium magnets, the strongest of their kind for guaranteed connectivity, so you can pick a 2D shape off the table and see it become a 3D construct that stays together. MAGFORMERS has more shapes and colors than any magnetic construction manufacturer, providing for more challenges in the realms of math and science. MAGFORMERS has recently launched its very first tech product this year, known as the Walking Robot. Click, connect and create! 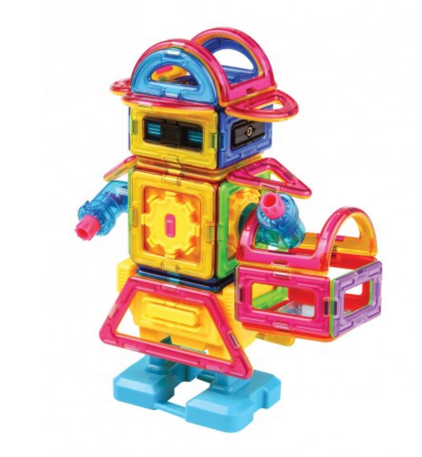 Kids can build 8 walking characters using the S.T.E.A.M engine block and walking accessories. Let your imagination run wild as you discover the strength of MAGFORMERS® and see what you can create! Built using the strongest, most effective magnets on the market, this cute walking robot will quickly become your child’s favorite toy and will challenge their minds at the same time! Watch your child's imagination run wild as they discover the strength of MAGFORMERS® and see what they can create! STEM education has never been so much fun! You can purchase the MAGFORMERS Walking Robot for $109.99 from the MAGFORMERS website.